TALLAHASSEE, Fla. – The day started with Florida State president John Thrasher leading FSU’s pep band, Seminole sound, in a pre-game rendition of the FSU Fight Song. About three hours later, after the clock ran out on No. 10 Florida State’s 73-68 win over No. 12 Louisville, that same space behind the basket was flooded with trumpet and tuba players, spillovers from the student section and, most noticeably, a line of Seminole basketball players, all of them coming together to celebrate the latest triumph in a season full of them. In front of a third-straight sell-out crowd at the Donald L. Tucker Center, the Seminoles raced out to a 14-0 lead – raising the decibel levels to uncommon heights along the way – and then held off a series of Louisville rallies to improve to 17-2 overall, 6-1 in the Atlantic Coast Conference. And for good reason. On Dec. 30, FSU visited Virginia for the first of six straight games against ranked opponents, the first time an ACC team had embarked on such a run since Maryland in 1992-93. The Seminoles beat the No. 12 Cavaliers that day, then reeled off victories over No. 21 Virginia Tech and No. 7 Duke and No. 15 Notre Dame before topping the Cardinals on Saturday. With only a setback at No. 11 North Carolina last week, the Seminoles emerged from one of the most difficult runs in recent college basketball history with five victories. “Us-against-the-world” is one of the most overused clichés in sports, but, in this case, Bacon may be right: The media picked FSU eighth in the ACC preseason poll, behind four teams the Seminoles have already beaten. Safe to say they’ve picked up a few believers since then. “They’re a great talent with great coaching,” Louisville coach Rick Pitino said. “They do a lot. They can beat you off the bounce one-one. They make their free throws. They have great shot-blocking ability and size. They have a lottery pick (Jonathan Isaac) as freshman. Bacon is a first-rounder. Indeed, not only did Florida State beat a ranked opponent for the sixth time this season, but the Seminoles did it in yet another different fashion. Whereas FSU has typically worn down its opponents with a 12-man rotation, the Seminoles on Saturday ran into an opponent that could nearly match them player for player. FSU used 12 different players on Saturday, Louisville 11. And in a startling role-reversal, FSU’s bench was outscored 40-11 – the first time that’s happened in six games. Not to worry. Sometimes having good depth means having good starters, and the Seminoles’ starters shined on Saturday. 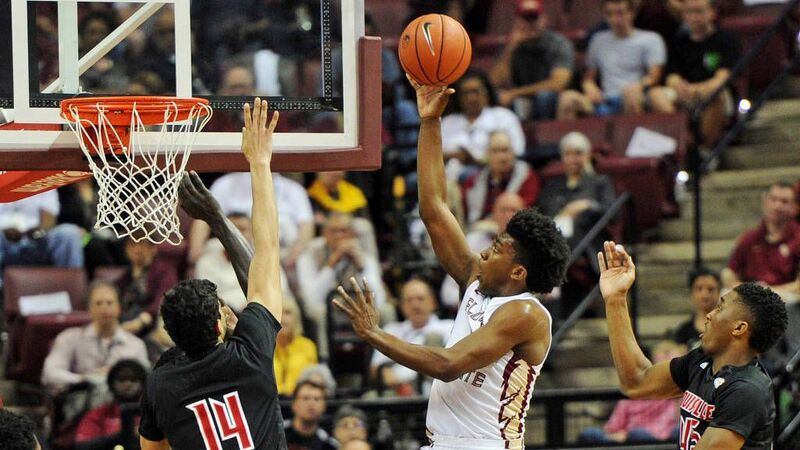 Freshman Jonathan Isaac had 16 points and 10 rebounds to become the first FSU freshman with three straight double-doubles since Corey Louis in 1994-95. Isaac’s 10th rebound came with less than 30 seconds left, as he thwarted a layup attempt with less than 30 seconds to play and the Seminoles leading by four. Bacon, meanwhile, chipped in 16 points and three rebounds and Terance Mann, who was shut out in both points and rebounds during Wednesday’s win over Notre Dame, bounced back with 15 points and three boards. Even center Michael Ojo, bolstered by a 6 of 7 effort from the free-throw line, reached double-digits with 10 points and six rebounds. After trailing by as much as 16-2, Louisville controlled much of the action heading into halftime and went into the break trailing by six. The Cardinals often threatened down the stretch, but, in what Bacon called a testament to FSU’s resilience, never could finish their rally. On three separate occasions, Louisville cut its deficit two just one point in the second half. Both times, however, FSU answered with quick scoring runs that brought the crowd back to life and threw the Cardinals out of sync. As usual, several Seminoles took turns in the spotlight: When Louisville made it 54-53 with 11 minutes to go, FSU hit five straight free throws – two from Jarquez Smith and three from Jonathan Isaac, fouled from 3-point range – to get some breathing room. Then, when Louisville hit back with a five-point run of its own to make it 59-58 just minutes later, freshman C.J. Walker stemmed the tide with a falling, off-balance reverse layup that led to a 3-pointer from Xavier Rathan-Mayes. Finally, when Louisville’s Jaylen Johnson threw down a dunk to bring the Cardinals within 69-68 at the 2-minute mark, FSU responded by tightening up on defense and coming through at the free-throw line. Johnson’s dunk turned out to be the Cardinals’ final points of the game and their only made field goal in the last 3:50. Bacon and Isaac, meanwhile, each made a pair of free-throws in the final minutes to provide the final margin. “We believe in each other,” Hamilton said. “And I think that’s allowed them to maintain some focus. We work on last-minute situations, not a whole lot, but enough for the guys to understand what we expect of them. No. 10 Seminoles Play Host To Louisville on Saturday at 2:00 P.M.